After the Tiger killed a 23 year old pregnant woman on Wednesday, the government has ordered the Tiger to killed. Anjana Appanna Hanbar (23) was killed by the tiger in Madgai village of Khanapur taluk. A special team from Bengaluru has also arrived. However no sighting of the Tiger was done on Friday, the forest officials are doing a combing operation in the nearby areas. It is feared it is the same Tiger released here in November end brought from Chikmangluru. It was radio collared but currently no signals are being received and hence forest officials are still unclear whether it is the same Tiger. But now as shoot at sight orders have been given after the recent death of the woman, the villagers are still living in fear. Once it statrted eat human then it’s a man eater now it knows very well human is easy hunt now tiger I’ll not think which is correct or wrong it just need calm its hunger n it I’ll go on till it’s end now u think what to do to ? Please don’t kill the tiger !! Can we Belgaum citizens (oops!! Belagavi citizens) start a save the Belgaum Tiger campaign !!!! All people fighting for tiger rights – why don’t you go in search of the tiger n interview it on why he doesn’t let humans live. A tigers right is to eat humans is it but humans shoul save the tiger so he continues to eat humans? Heights of stupidity. Killing Tiger is not a solution at all…. If at all a man kills a person, then do you shoot that man??? Terrorists are killing in mass. Do you shoot them?? Still many murderers are roaming on roads. Why you want to kill a tiger which is claiming its rights? We have acquired their forests, and they have a right to live. Seriously its a wrong decision to kill that tiger.change the decision and save the tiger. 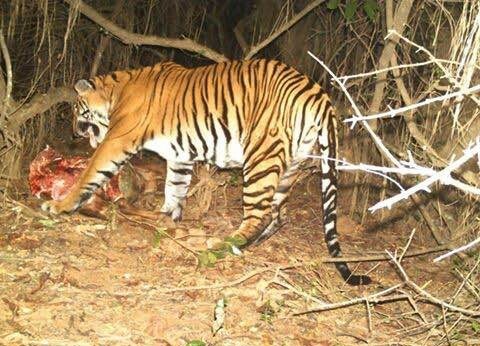 Take all possible help to trace the tiger(search thru helicop may also help). Villagers must be cautious n avoid roaming after sunset. Trap the tiger n leave it in a zoo. Kill isnt solution. Save this endangered animal which helps to maintain the ecological balance of forest. Please dont Kill the tiger ;-( .. its bad to see that humans are interfering Animal’s life since long time………, killing them just for joy,,,,cuttings jungles…..Where they will go ????? this planet is originally belong to animals,,, humans came later…………and now they dont have place to stay….. what if humans dont have place to stay. no food to eat ,,,, what humans will do ???? and tiger is born to hunt and eat………… got created him like that way…………but humans are not born to kill or hunt ,,,,,,, and eat :-O ………… why humans are behaving like animals ????? like us they also have life……. they also feel hunger ……….. It feels bad for a girl got killed, she would be one of my family member too, but it means not that u kill the tiger……… Please please dont kill the tiger…….. this planet is not for only fir humans,,,,,, it is for animals too ……….and tiger is our national animal, have respect……….. If they don’t kill, how could tigers feed their hunger??? Tiger was basically from South Karnataka and they released in Khanapur Jungle because this area there is no strong politician in Govt and it is also Marathi speaking border area. Instead of killing the Tiger…. It is better to keep in a zoo till rest of its life by this it will harmless to human. On one side we launched many projects to Save Tiger the endanger species and other side given order to kill. Rajit, Ashish, absolutely correct… it is not the family matter here.. and that Tiger is not responsible for the Killing… It is our Govr Officials who are responsible for the killing…. and who are inefficient to still track the tiger and move it away…. I’m ready to die if the tiger wants to kill me but don’t shoot the tiger.. We humans have to be blamed for the problems faced by the wildlife.. Please capture it and transfer it to other forests..
Dear Ranjit, we humans are responsible for destroying natural habitat, now the animals are forced to find food outside their habitat, and this incident is an example. Instead of killing the tiger it can be caged and looked after. Killing is not the solution. Dear Ranjit, THEY TOO HAVE LIFE & THEY KILL BCZ ITS HOW THEY HAVE TO FULFILL THEIR HUNGER! If there is a problem, then make arrangements so that none is hurt by none other. If a tiger had killed any of my family members, then I would’ve killed a political leader who is responsible for safety of the cities/citizen/state & the whole nation(juz for my satisfaction as I feel taken revenge against my loss).